Hello Everyone, welcome to Day 1 Wplus9 February 2015 Release Previews. 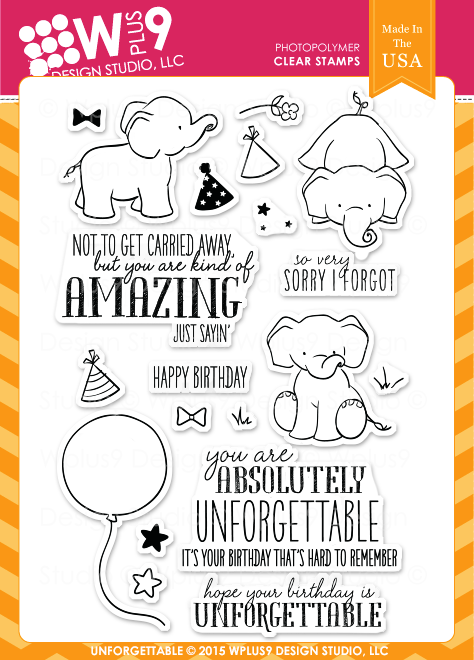 Today I am sharing some cards using the adorable ellie stamp set called Unforgettable this set also have a Coordinating Unforgettable dies. I am also using the upcoming Sending Sunshine die for ( (stitched clouds, and sun). 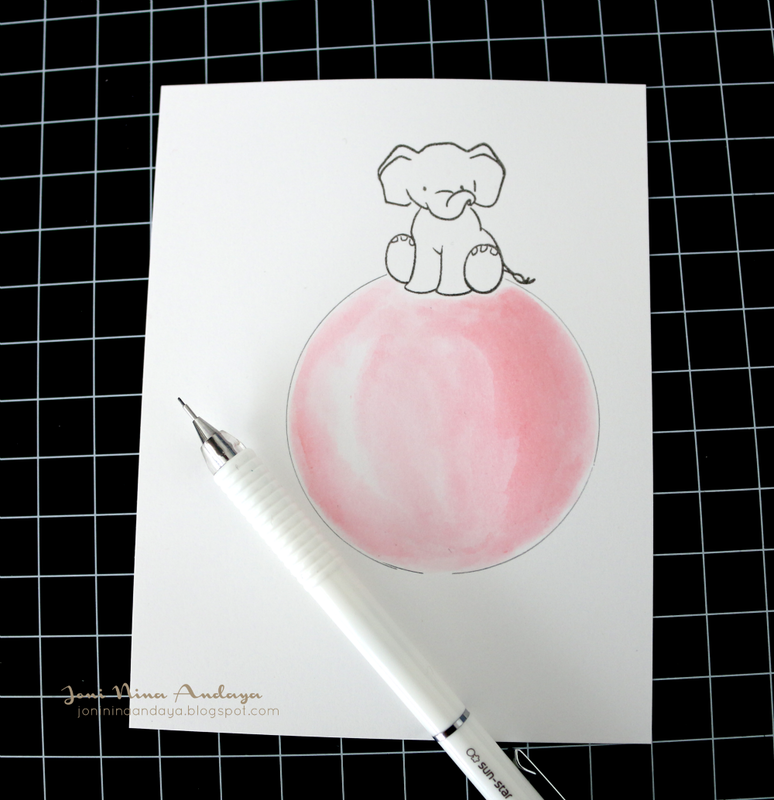 To begin my card I first stamp this adorable ellie on a watercolor paper using Versafine ink in Smokey Gray. Next, I drew a circle below the ellie as if he can sit on top of the balloon and can be carried by the wind. Then I watercolored the balloon and once its dry I fussy cut and stamped the sentiment from Unforgettable stamp set "not to get carried away but you are kind of amazing". Next, I watercolor another watercolor paper for the panel for my card with Distress ink using Tumbled Glass, just very lightly. Once its all dry, I adhered the ellie on top of the balloon, sun, and clouds with foam tape. I also added some natural twine on the balloon, added some splatter using Mister Huey's Classic Tan. To finish off the card I added some Pretty Pink Posh Lemon Meringue sequins. For my second project I created a window card this time avoiding to make another shaker, but this would be so perfect with a shaker right? 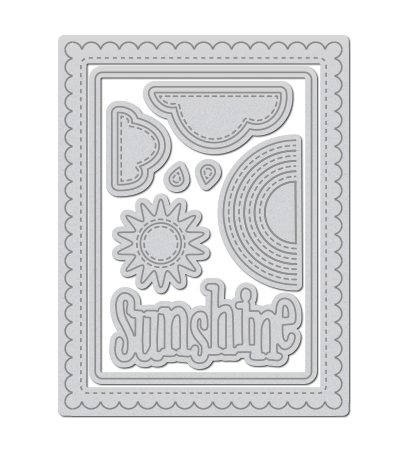 I used the Sending Sunshine die again in this project, Unforgettable stamp set, and the past released Heartfelt Mix stamp set for the clothes line image and sentiments. 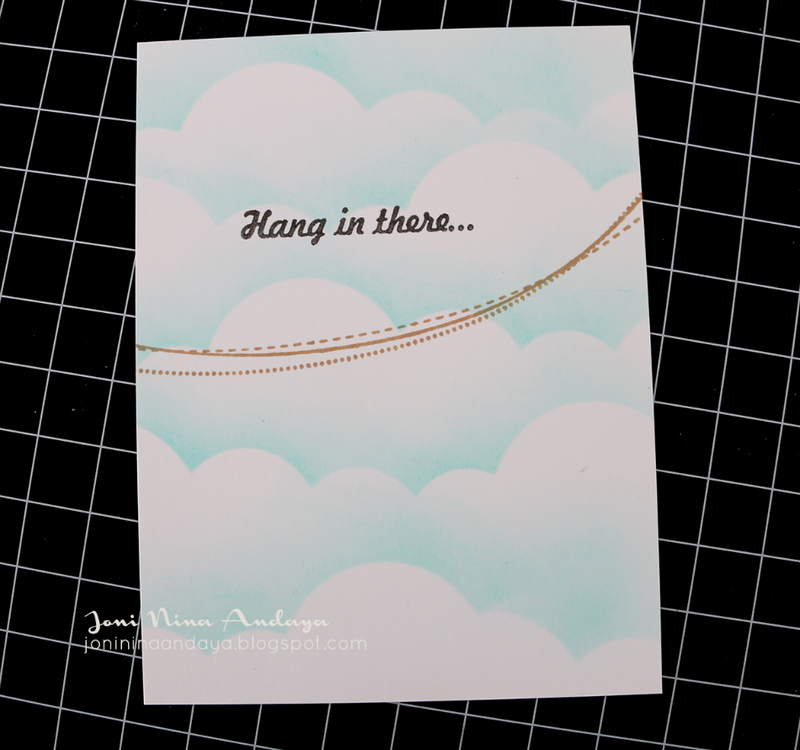 To begin my card I first created some clouds background using the new Wplus9 ink called Bo Peep a very pretty light blue and the past released Lake House dye ink. I then stamped the clothes line image from the Heartfelt Mix using the Wplus9 past released ink in Coconut Husk. 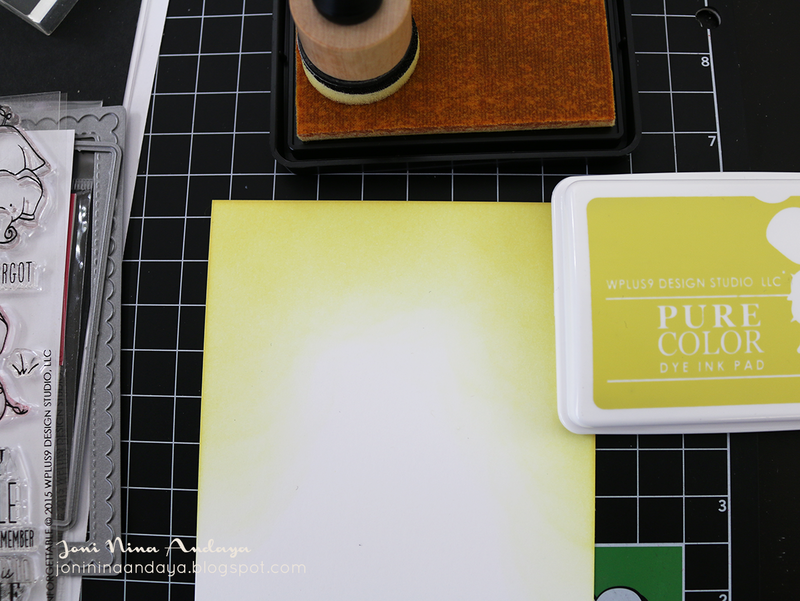 Next, I used another white cardstock panel for my window and distress it with another new upcoming ink from Wplus9 in Falling Stars dye ink, really pretty muted yellow ink. Next, I die-cut a window using the Sending Sunshine dies. Then colored, die-cut another one of the cute ellie image from Unforgettable stamp set. I also added some bows on her ears, the bows are included on the set as well and added the fussy cut sentiments from Heartfelt Mix stamp set. Then finish it off with Pretty Pink Posh Sparkling Clear sequins in 4mm, 6mm, and 8mm. All of the new products that you will see this whole week will be available on February 5th. OMYGOSH!! These are ADORABLE! I loveeeeeeee those elephants!!!!!!!!!! Oh my gosh!!!! This elephant is so cute!!!! I need it to be my very first wplus9 purchase!!! Both ADORABLE cards!! Love your coloring & inking! Both these sets are super cute & would make many fun cards!! Super cute cards, Joni! LOVE them! Gorgeous cards!!!!! I am loving this release sooo much! These are precious! I love your big balloon! I'm in love with these elephants! Great card! I love those elephants (they are on my list). Both card designs are so fun and cute! Your cards are just fantastic! The elephants could not be more adorable. Your features are just stunning!! This elephant set is absolutely adorable!! This is definitely a must-have! Both of your cards are adorable! TFS! Oh, I love both of these, Joni! Oh these are just beautiful Joni!! You have done amazing things with the new releases! OH JONI!! these are just fantastic!!! Love your creations so much... ellies are adorable! 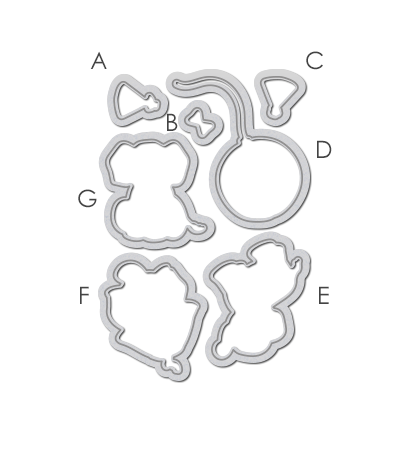 cute cute and more cute - the elephant set is cutielicious! What a great job you did painting those elephants! Joni, your watercolor elephant on the watercolor balloon is about the sweetest thing I've ever seen!!! The brown spatters and the yellow sequins are the perfect additions, although definitely not predictable. Some seriously great designin' going on here!!!! I'm in love with those Ellies! Wonderful, beautiful cards!! Joni your cards are absolutely gorgeous. I love those sweet elephant images in the unforgettable set. OMG, love your cards---so very adorable! And your watercoloring is wonderful. You've really sold me on wanting the new inks! There is some serious cuteness going on here Joni!! So adorable cards! 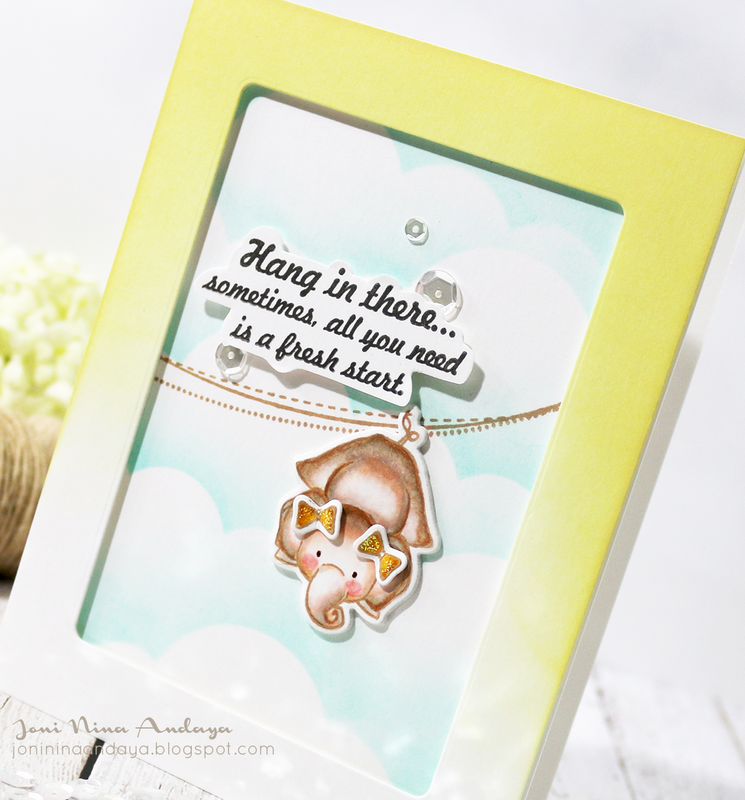 Love them both and that little elephant is just too cute to be true..
What a fabulous showcased cards, love the watercoloring on first one, looking so realistic and the another one is too adorable with your creativity, totally love them!!! SO so so very cute and sweet..LOVE it! Totally gorgeous and creative cards! That first elephant is just too sweet! Love the elephants. That new color of yellow on your card is so very pretty. STUNNING cards. I love how you created the elephant on top of the balloon. Thank you for the details on how you created it. I also love the second card. This set is a must have!! Gorgeous creations! Ellie is totally adorable!!! And I love the beautiful new ink colors too!!! I love all your projects and creative designs,like the balloon! Can't wait for my products to arrive ,they shipped already!